ShoreDocker docking systems - the ingenious and affordable way to dock your watercrafts! Innovative Outdoors is an industry leader in providing inventive docking solutions – jet ski lifts / jet ski roller ramps, boat shore docking roller ramps. Our line of products, including the Roll-n-Go® On-Shore Docking Systems and ShoreDocker™ Boat Ramp Systems, are changing the way boats, personal watercrafts (jet skis), and pontoons are launched, docked, and stored. Constructed and assembled with safe, simple, and sturdy materials, our products are made to accommodate a wide variety of shorelines to save you time, effort, and expense. 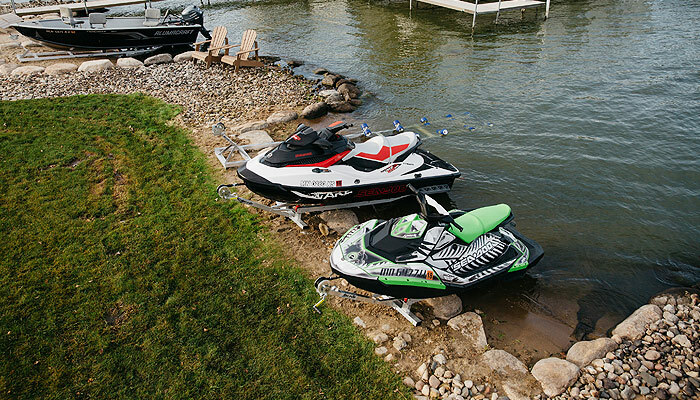 Whether you’re in the market for a PWC lift, jet ski ramp, or a DIY boat docking system, Innovative Outdoors has what you need. In addition to its aluminum and wood rail structures for watercrafts, Innovative Outdoors also has aspirations to expand beyond marine solutions to service the needs of other outdoor recreational activities. Like us on Facebook and stay tuned to InnovativeOutdoors.com for new and exciting outdoor product innovations.